Ontario: On Walpole Island, across the St. Clair River from Algonac, a monument marks the final burial place of the heroic Shawnee warrior Tecumseh. It's disputed whether his bones are actually there. What's beyond argument, however, is that Tecumseh is among the most compelling figures of North American history. Had things gone differently, Tecumseh might be remembered as another George Washington, or perhaps as another Saladin, a warrior-king who rescued his people from an invading horde. Tecumseh was everything you could wish in a leader, a rare blend of charisma, courage, athleticism and intelligence. In Canada, he is hailed as a national hero, a fearless ally who helped keep southern Ontario from being forcibly annexed into the United States. In 1774, Tecumseh's father, (Pucksinwa,) died at the Battle of Point Pleasant in today's West Virginia. The bloody clash near the Ohio River pitted Virginia frontiersmen against a Shawnee-Mingo army. According to lore, the dying father took the hand of his eldest son, (Chicksika), and implored him to raise the 6-year-old Tecumseh as a warrior who never would surrender their homeland. The promise was kept. By the early 1800s, Tecumseh and his youngest brother, a visionary known as The Prophet, sought to unite the Midwest and Southern tribes in an alliance against the illegal immigrants who threatened their way of life. In the War of 1812, Tecumseh's confederation join the British army in Canada at the headwaters of the St. Lawrence River. At first, the fight went well. Tecumseh and a brilliant British commander, Gen. Isaac Brock, captured Detroit and seized control of the Michigan Territory. In the autumn of 1812, however, the tide turned when Brock was killed in battle near Niagara Falls. Late the next summer, American naval forces won the Battle of Lake Erie. "We have met the enemy, and they are ours," Oliver Hazard Perry reported to Gen. William Henry Harrison, commander of the Army of the Northwest. Perry's victory forced Brock's successor, Gen. Henry Procter, to flee Fort Detroit. His army followed the Thames River as it retreated toward the Niagara Escarpment. 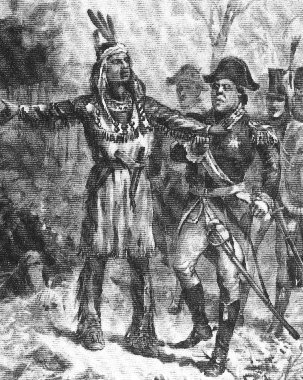 Despite a premonition of his own death, Tecumseh convinced Procter to make a stand northeast of Chatham, Ontario. The Indians held their ground and fought against impossible odds until Tecumseh fell. With his death, it was over. The battle was lost, and with it went the dream of an independent Indian nation bordering the Great Lakes. American forces soon reclaimed Michigan. Over the years, dozens of versions of Tecumseh's death have been told. In some cases, eyewitnesses who had fought side by side told very different stories. One popular account credited Col. Richard Mentor Johnson for Tecumseh's death. Johnson, who became Vice-President under Martin Van Buren, was honest about his doubts. "They say I killed him; how could I tell?" Johnson told an interviewer. "I was in too much of a hurry, when he was advancing on me, to ask his name, or inquire after the health of his family." William Henry Harrison also gained fame for his actions. He became President in 1840, but died of pneumonia on his 32nd day in office. It's still unsure what happened to Tecumseh's body. Some say Tecumseh's comrades carried his corpse from the battlefield to keep Americans from mutilating it. (Mutilation was often practiced by whites and Indians alike in that era's genocidal wars.) Many believe his body is buried on Walpole Island. But not everyone is convinced. Thomas Wildcat Alford, a member of the Absentee Shawnees of Oklahoma and Tecumseh's great-grandson, investigated the question. He concluded the body was buried near the battlefield at a site that later flooded, washing away all evidence of the grave. "Rather than dig haphazardly in an effort to find the bones, the remains were left in place," he wrote. "The Shawnees still maintain their vigil at this spot with racial fidelity, in sorrow and silence." Tecumseh's gravesite is a mystery that may never be solve. As one elderly clergyman from Moraviantown puts it, the location of the grave is "a secret no white man can ever know."